The ability of humankind to mold and shape the world is unparalleled by any other species. While at times this ability has resulted in great success and accomplishment, we are now seeing other—much less positive—effects of this ability. Scientists have observed that the rate at which plant and animal species are going extinct on Earth are nearly 1,000 times higher than normal. In fact, the rapid rate of extinction has lead scientists, and conservationists alike, to declare that we are in the middle of the sixth mass extinction of species. Earth has borne witness to wide-spread extinctions before, but this time there is undeniable evidence that species are disappearing as the result of human actions. Habitat loss and degradation coupled with an altered climate and rapidly warming global temperatures has fundamentally changed the very biosphere of our planet. This is forcing species to adapt or perish at a rapid pace, and trends have shown a strong tendency to the latter. World Wildlife Fund, in collaboration with the London Zoological Society, published a study entitled, “Living Planet Report 2014,” that addresses the issue of global species loss. Overall, the report deduced that in the past 40 years, the world has lost a stunning 52 percent of wildlife. That means that if you were born in 1970, the world has lost over half of the species that existed at your birth. While this might sound daunting, there is still hope for the species that remain on Earth. However, seeing this outrageous statistic, it is wildly apparent that in order to save these remaining species, we need to take action now! The first step in making change is spreading knowledge, so share this infographic and let’s spread the word that the world’s species need our help now! 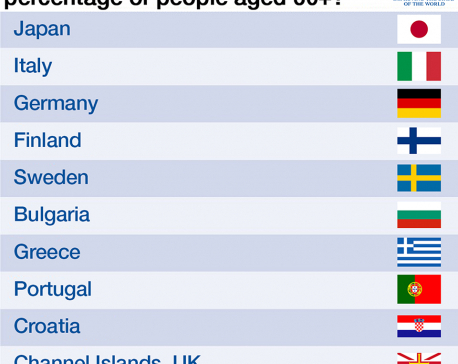 Infographics: Which nations have the highest percentage of people aged 60+?